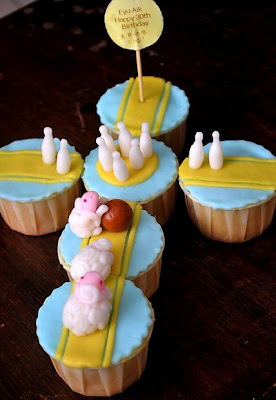 Mom And Daughter Cakes: Three Little Lambs Playing Bowling? Three Little Lambs Playing Bowling? 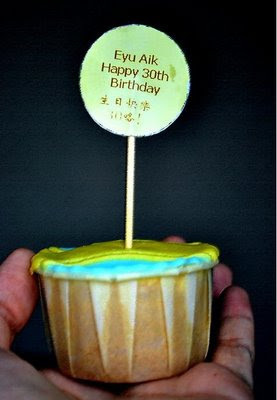 A good friend Mr.Egg celebrated his 30th birthday. He kept begging me to make him a special fondant cake on his birthday when he got to know I could do it earlier on. Why not? He's my ex-colleague who loves writing, blogging, photography, calligraphy.....and bowling. Too many interests of him, I was quite headache actually when I tried to 'create' his cake. At the age of 30, he's still very much a teenage kid and his zodiac is goat or lamb, in Chinese, it's still 羊 afterall. 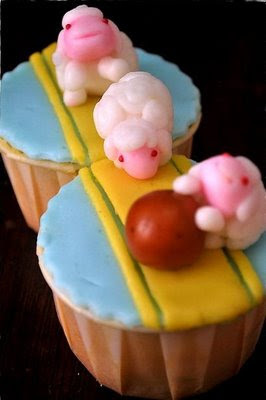 Finally I came out with this, 6 cupcakes with the theme of 'lambs and bowling'. Mr. Egg is the papa lamb, throwing out the ball but his mischievous baby lamb immediately grabs it and Mr. Egg almost loses his mind. Mama lamb, Mr. Egg's loving wife is calmly walking over to stop her baby, hehe...I like my cakes to tell a story. The hardest part of the design is the sculpting of 10 tiny bowling pins, the rolling-up of lamb's wool is much easier relatively. Mom helped me to bake the vanilla butter cake. Mr. Egg was so excited when he saw the birthday gift. Mr. Egg: I wanna keep the cupcakes! Mr. Egg: Ok, just the cake, I'll keep the lambs and bowling. hehe, then you're another kid. actually i like my cake to be appreciated, people like you guys would really make my day. the lambs and the bowling pins are still in good condition!